MIAMI (AP) — Even after the confetti fell and the champagne spilled, in the early moments of a Game 7 celebration, LeBron James couldn't forget Game 6. 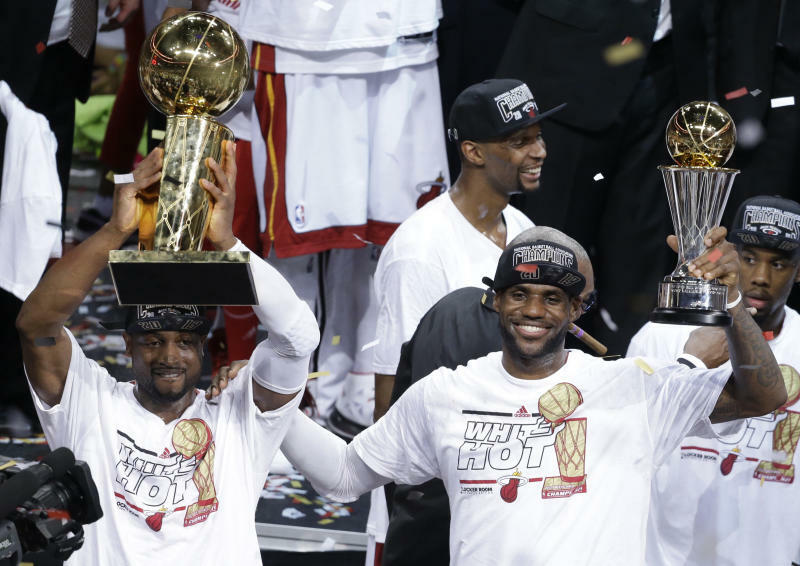 The championship the Miami Heat won Thursday was almost lost two nights earlier. So when James remembers his second straight title, the save goes right along with the win. "To be able to win that game and force a Game 7 is a true test of our, I guess, perseverance," James said, "and us being able to handle adversity through everything. It meant a lot for us to be able to do that and force a Game 7 and being able to close out at home." Doing it that way, following a stunning comeback with a stirring victory, cemented a place with the NBA's giants for this Miami team and its leader. "Last year when I was sitting up here with my first championship, I said it was the toughest thing I had ever done," James said. "This year, I'll tell last year he's absolutely wrong. This was the toughest championship right here between the two." And the San Antonio Spurs will always know it's a title they let slip away. James scored 37 points and grabbed 12 rebounds in a 95-88 victory Thursday night in a tense game that was tight until Miami pulled away in the final minute. Capping their best season in franchise history — and perhaps the three-superstar system they used to build it — the Heat ran off with the second straight thriller in the NBA's first championship series to go the distance since 2010. "I work on my game a lot throughout the offseason," said James, who was MVP for the second straight finals. "I put a lot of work into it and to be able to come out here and (have) the results happen out on the floor is the ultimate. The ultimate. I'm at a loss for words." Players and coaches hugged afterward — their respect for each other was obvious from the opening tipoff of Game 1 through the final buzzer. A whisker away from a fifth title two nights earlier, the Spurs couldn't find a way to win it all in what was perhaps the last shot for Tim Duncan, Parker and Manu Ginobili to grab another ring together. "In my case I still have Game 6 in my head," Ginobili said. "Today we played an OK game, they just made more shots than us. LeBron got hot. Shane (Battier), too. Those things can happen. But being so close and feeling that you are about to grab that trophy, and seeing it vanish is very hard." Wade had 23 points and 10 rebounds for the Heat, who overcame a scoreless Chris Bosh by getting six 3-pointers and 18 points from Battier. "It was a great series and we all felt that," Spurs coach Gregg Popovich said. "I don't know if 'enjoy' is the right word, but in all honesty, even in defeat, I'm starting to enjoy what our group accomplished already, when you look back. And you need to do that, to put it in perspective. So it's no fun to lose, but we lost to a better team. "And you can live with that as long as you've given your best, and I think we have." Streamers fell from the arena ceiling onto the fans for the second straight year, but this one meant so much more. A narrow escape in Game 6 was still fresh in everyone's mind. They were down 10 in the fourth quarter of that one before James led the charge back, finishing with a triple-double in Miami's 103-100 overtime victory. This one was nearly as tight, neither team leading by more than seven and the game tied 11 times. Kawhi Leonard had 19 points and 16 rebounds for the Spurs, who had been 4 for 4 in the championship round. Ginobili had 18 points but Parker managed just 10 points on 3-of-12 shooting. "Just give credit to the Miami Heat. LeBron was unbelievable. Dwyane was great. I just think they found a way to get it done," Duncan said. "We stayed in the game. We gave ourselves opportunities to win the game, we just couldn't turn that corner." The Heat and coach Erik Spoelstra collected the Larry O'Brien trophy again from Commissioner David Stern, presiding over his last NBA Finals before retiring next February. He couldn't have asked for a better way to go out. He said he would appreciate this one more because of how tough it was. The Heat overpowered Oklahoma City in five games last year, a team of 20-something kids who weren't ready to be champions yet. This came against a respected group of Spurs whose trio has combined for more than 100 playoff victories together and wanted one more in case this was San Antonio's last rodeo. Duncan is 37 and Ginobili will be a 36-year-old free agent next month, the core of a franchise whose best days may be behind them. Meanwhile, it's a potential dynasty along Biscayne Bay, but also one with a potentially small window. Wade's latest knee problems are a reminder that though he came into the NBA at the same time as James and Bosh 10 years ago, he's a couple of years older at 31 with wheels that have seen some miles. James can become a free agent again next summer with another decision — though hopefully not another "Decision" — to make. He's comfortable in Miami and close with Wade, and the Heat have the leadership and commitment from owner Micky Arison and President Pat Riley to keep building a championship core around him. "This team is amazing," James said. "And the vision that I had when I decided to come here is all coming true." 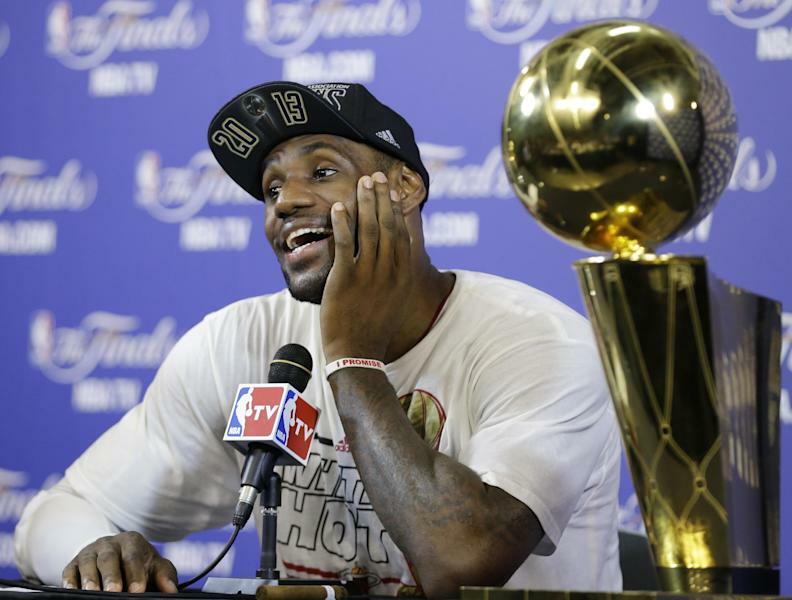 Notes: Home teams are 15-3 in Game 7s of the NBA Finals. ... Miami improved to 5-3 all-time in Game 7s in the postseason and became the fourth team to win the final two games at home since the finals went to a 2-3-2 format in 1985, joining the Lakers in 1988 and 2010, and Houston Rockets in 1994. ... Green was just 1 for 12, going 1 for 6 behind the arc. He started the series by making 25 3s in the first five games, a finals record for an entire series.